View an extensive collection of decorative arts at Palacio Taranco, featuring rooms stacked with European period furniture, draperies, ornaments, sculptures, textiles, and portrait paintings. French architects Charles Louis Girault and Jules Chifflot León--the creators of the Arc de Triomphe in Paris--designed the palace in the early 20th century. The eclectic interior combines diverse elements from Persian curtains to Flemish tapestries. Climb the marble spiral staircase, which links the lobby with the halls, and walk across the oak floors designed in the style of Versailles. See the dining hall, billiards room, smoking lounge, and library, all lavishly furnished in Louis XV, Louis XVI, and Regency styles. The palace's museum also boasts an important collection of classical art and archeology, including Greco-Roman ceramics. Using our online itinerary creator, Montevideo attractions like Palacio Taranco can form part of a personalized travel itinerary. 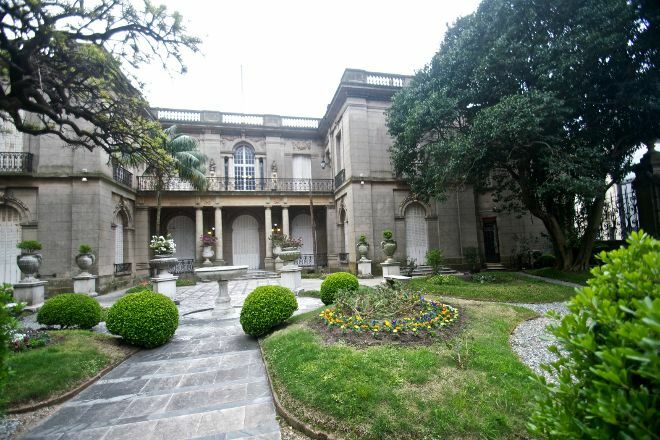 It is a museum that is near the cathedral of Montevideo on the way to the port market. I loved it, I found it very beautiful, well cared for, very attentive and polite staff and is free. It is advisable to visit it keeps all the furniture of the time this in Old town close to everything.